Motorola is launching its mid-range G6 series next week and we just saw some cool renders of the trio. It's now turn for the entry level Moto E5 to take a trip around leakland as it visited Geekbench. 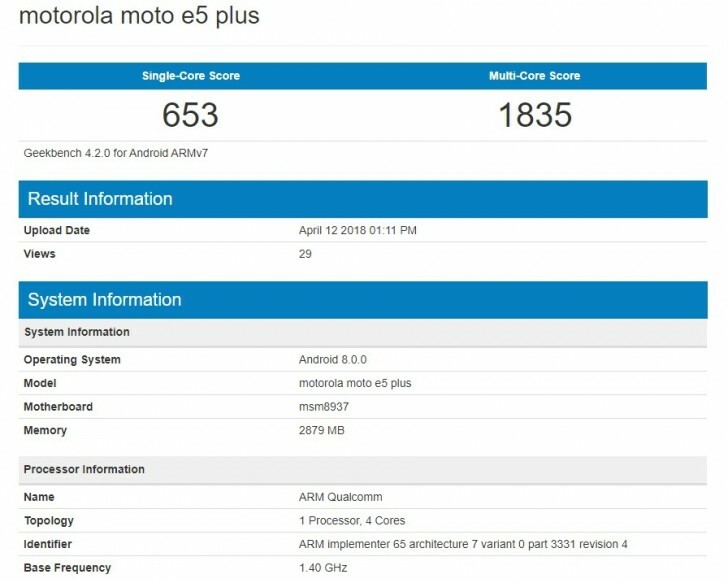 Almost a month after the hands-on photos of the Moto E5 Plus, the phone popped on Geekbench, revealing primary specs. The chipset, listed as msm8937 is the Snapdragon 430 by Qualcomm, coupled with 3 GB RAM. All new phones of the Lenovo subsidiary come with stock Android and the Moto E5 Plus is not expected to be any different. The rest of the specs sheet is yet to be completed, although we know that the E5 Plus will have an 18:9 ratio display and a fingerprint scanner, embedded in the Moto logo on the back. The 430 is not useless at all, if it was no one was use it. In fact it's VERY useful and performance is more than good enough for millions and millions of people.